The time has come for us to polish up our horns, restring our golden lyres, and hitch our wagon to Apollo’s chariot: like the Sun, Mucca Pazza is traveling West! If you have friends in any of these fine cities, please make haste to send them a message by Pony Express: alert them that an orchestra with legs approaches, across river, through plain and over mountain! Reno, NV 3/31! Davis, CA 4/1! San Francisco 4/2! Visalia, CA 4/3! Los Angeles, CA 4/4! Las Vegas, NV 4/5! Read on for more! After 1,912 miles, our first stop on our West Coast tour will be our first ever show in the Biggest Little City! We’re excited to play the Studio on 4th, which by all accounts is the place to be in Reno. You Only Live Once - and Davis, CA is the most populous city in Yolo County! We wouldn’t dream of missing an opportunity to play in the most bicycle-friendly town in the world. Oh San Francisco, how we love you! Meet us at the Bottom of the Hill on Sunday night and we will play you a heartfelt serenade that just might blow the fog all the way across the Bay. 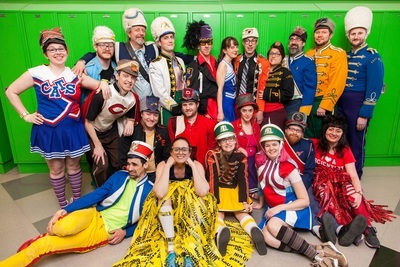 Calling all odd fellows to the Odd Fellows Hall: Mucca Pazza promises to bring the weirdness and all you have to do is get there! We’re gonna be a star! If you’re in LA, come kick up your boots with us at the Bootleg Theater on April 4th. Our first proper Sin City show be our last of the tour. What happens in Vegas stays in Vegas… for one night only, and then it goes back home to Chicago. Skip the slot machines and meet us at the Bunkhouse Saloon - we’re a gamble you’re certain to win.